Rolf Furuli’s new book on chronology, Assyrian, Babylonian and Egyptian Chronology (Oslo: Awatu Publishers, 2007), covers 368 pages. Chapter 6 (pages 94-123) and Appendix C (266-325), which together cover 90 pages or about 25 percent of the book, are devoted to an attempt to overcome the evidence provided by the astronomical cuneiform tablet VAT 4956, dated to the 37th year of Nebuchadnezzar II. VAT 4956 is a so-called astronomical “diary” that records the positions of the moon and the five planets visible to the naked eye observed during the 37th year of Nebuchadnezzar. About 30 of these records are so well preserved that they can be checked by modern computations. These computations have confirmed that the 37th year of Nebuchadnezzar corresponds to year 568/567 BCE (spring-to-spring). For a detailed description of this tablet and its importance for the absolute chronology of the Neo-Babylonian period, see pages 157-164 of my book The Gentile Times Reconsidered, 4th edition (Atlanta: Commentary Press, 2004). HAS VAT 4956 BEEN “TAMPERED WITH” IN MODERN TIMES? What about the claim that someone in modern times has “tampered” with the signs on the tablet and, by using “a modern grinding machine on the edge of the tablet,” has incised the signs for ‘year 37’ and ‘year 38’ on the tablet? Furuli proposes this idea as a “hypothesis,” as he knows very well that he has not been able to present any evidence in support of the idea. According to Furuli’s hypothesis, the supposed modern forger did not only incise the signs for “year 37” and “year 38” at the edge of the tablet. He also incised the signs for “year 37” and “manipulated” the signs for the name of the king, Nebuchadnezzar, in the beginning of line 1 on the obverse. The first question is how he could have done this, as there would have been no space at all at the beginning of the line for adding anything? As the article by Neugebauer and Weidner clearly shows, the date and the royal name (“year 37 of Nebuchadnezzar”) were already on the tablet in 1915 when they were examining it. Are we to believe that these two scholars were forgers, who co-operated in removing some of the original signs on the tablet and replacing them with signs of their own preference? Even Furuli admits that he “cannot imagine that any scientist working with the tablet at the Vorderasiatische Museum has committed fraud.” (Furuli, p. 285) He has no idea about who the supposed forger may have been, or how he/she managed to change the signs on line 1 without leaving any traces of it on the tablet. Finally, Furuli’s hypothesis is self-contradictory. If it were true that the planetary positions “represent backward calculations by an astrologer who believed that 568/67 was year 37 of Nebuchadnezzar II,” and if it were true that “the original tablet that was copied in Seleucid times was made in 588/87,” which Furuli argues was the 37th year of Nebuchadnezzar, then the astrologer/copyist must have dated the tablet to the 37th year of Nebuchadnezzar from the very beginning! No modern manipulation of the date would then have been necessary. Furuli’s hypothesis is simply untenable. The only reason for his suggesting it is the desperate need to get rid of a tablet that inexorably demolishes his “Oslo [= Watchtower] chronology” and firmly establishes the absolute chronology for the reign of Nebuchadnezzar II (604-562 BCE). As discussed in chapter 4 of my book The Gentile Times Reconsidered (Atlanta: Commentary Press, 2004), there are at least nine other astronomical tablets that perform the same service. Furuli’s futile attempts to undermine the enormous burden of evidence provided by these other astronomical tablets will be discussed in another, separate part of this review. The question that remains to be discussed here is Furuli’s claim that the lunar positions that were observed in the 37th year of Nebuchadnezzar and are recorded on VAT 4956 fit the year 588/587 better than 568/567 BCE. FIT 588/587 BETTER THAN 568/567 BCE? On the back cover of his new book Rolf Furuli states that the conclusion of his study is that “the lunar data on the tablet [VAT 4956] better fit 588 than 568 B.C.E., and that this is the 37th year of Nebuchadnezzar II.” What about this claim? A careful examination of all the legible lunar positions recorded on this astronomical “diary” proves that the claim is false. Almost none of the lunar positions recorded on VAT 4956 fit the year 588/587 BCE, while nearly all of them excellently correspond to lunar positions in the year 568/567 BCE. The astronomy program used for this examination is Chris Marriott’s SkyMap Pro 11.04, which uses the modern complete ELP2000-82B lunar theory. The “delta-T” value used for the secular acceleration of the Moon is 1.7 milliseconds per century, which is the result of the extensive research presented by F. Richard Stephenson in his Historical Eclipses and Earth’s Rotation (Cambridge, 1997). The program used, therefore, maintains high accuracy far into the past, which is not true of many other modern astronomy programs. On the obverse, line 17, VAT 4956 states that on day 15 of month III (Simanu) there was a “lunar eclipse that was omitted.” The phrase refers to an eclipse that had been calculated in advance to be invisible from the Babylonian horizon. In the traditional date for the 37th year of Nebuchadnezzar, this eclipse can easily be identified with the eclipse of July 4, 568 (Julian calendar). Thus the Babylonian date, the 15th of month III, corresponds to July 4, 568 BCE. From that date we may count backward to the 1st of month III, which must have been June 20/21 (sunset to sunset), 568. As the tablet further shows that the preceding Month II (Ayyaru) had 29 days and Month I (Nisannu) 30 days, it is easy to figure out that the 1st of Ayyaru fell on May 22/23, 568, and the 1st of Nisannu (i.e., the 1st day of year 37) on April 22/23, 568 BCE. On moving back 20 years to 588/87 BCE – the 37th year of Nebuchadnezzar in Furuli’s alternative “Oslo Chronology” – we find that in this year, too, there was a lunar eclipse that could not be seen from the Babylonian horizon. It took place on July 15, 588 BCE. According to Furuli this is the eclipse that VAT 4956 dates to the 15th of month III (Simanu). Reckoning backwards from July 15, Furuli dates the 1st of month III to June 30, 588; the 1st of month II (Ayyaru) to June 1, 588, and the 1st of month I (Nisannu) to May 1. (In his discussions and/or calculations he is inconsistently alternating between May 1, May 2, and May 3). There are a number of problems with Furuli’s dates. The first one is that the first day of the Babylonian year, Nisannu 1, never began as late as in May! As shown by the tables on pages 27-47 in R. A. Parker & W. H. Dubberstein’s Babylonian Chronology (Brown Univeristy Press, 1956), the 1st of Nisannu never once in the 700-year period covered (626 BCE – CE 75) began as late as in May. The same holds true of the subsequent months: the 1st of Ayyaru never began as late as on June 1, and the 1st of Simanu never began as late as on June 30. For this reason alone the lunar eclipse that VAT 4956 dates to the 15th of month III cannot be that of July 15, 588 BCE! This eclipse must have fallen in the middle of month IV in the Babylonian calendar. Furuli’s “point of departure” for his “Oslo Chronology,” therefore, is quite clearly wrong. Very interestingly, the lunar eclipse of July 15, 588 BCE was recorded by the Babylonians on another cuneiform tablet, BM 38462, No. 1420 in A. Sachs’ LBAT catalogue, and No. 6 in H. Hunger’s Astronomical Diaries and Related Texts from Babylonia (ADT), Vol. V (Wien, 2001). I discussed this tablet on pages 180-182 of my book, The Gentile Times Reconsidered (3rd ed. 1998, 4th ed. 2004). The chronological strength of this tablet is just as decisive as that of VAT 4956. It contains annual lunar eclipse reports dating from the 1st to at least the 29th regnal year of Nebuchadnezzar (604/603 – 576/575 BCE). The preserved parts of the tablet contain as many as 37 records of eclipses, 22 of which were predicted, 14 observed, and one that is uncertain. The second eclipse in month X – six months after the first – took place on January 8, 587 BCE. This date, therefore, corresponded to the 13th of month X in the Babylonian calendar. This agrees with Parker & Dubberstein’s tables, which show that the 1st of month X (Tebetu) fell on 26/27 December in 588 BCE. The Babylonians divided the 24-hour day into 12 beru or 360 USH (degrees), so one beru was two hours and 5 USH (= degrees of four minutes each) were 20 minutes. According to the tablet, then, this eclipse began 2 hours and 20 minutes before sunrise. It was total (“All of it was covered”), and it “[set eclips]ed,” i.e., it ended after moonset. What do modern computations of this eclipse show? Furuli attempts to dismiss the enormous weight of evidence provided by this tablet in just a few very confusing statements on page 127 of his book. He erroneously claims that the many eclipses recorded “occurred in the month before they were expected, except in one case where the eclipse may have occurred two months before.” There is not the slightest truth in this statement. Both the predicted and the observed eclipses agree with modern computations. The statement seems to be based on the gross mistakes he has made on the previous page, where he has misidentified the months on LBAT 1421 with disastrous results for his calculations. In the examination below, the lunar positions recorded on VAT 4956 are tested both for 568/567 BCE as the generally accepted 37th year of Nebuchadnezzar and for Furuli’s alternative dates in 588/587 BCE as presented on pages 295-325 of his book. Furuli has also tested the lunar positions for the year 586/585 BCE, one Saros period (223 months, or 18 years + c. 11 days) previous to 568/567. As Furuli himself rejects this year as not being any part of his “Oslo Chronology”, I will ignore it as well as all his computations for that year (which in any case are far from correct in most cases). (1) Obv.´ line 1: “Year 37 of Nebuchadnezzar, king of Babylon. Month I, (the 1st of which was identical with) the 30th (of the preceding month), the moon became visible behind the Bull of Heaven”. The information that the 1st of Month I (Nisannu) was identical with the 30th of the preceding month is given to show that the preceding lunar month (Addaru II of year 36, as shown also at Obv. line 5 of our text) had only 29 days. In 568 BCE the 1st day of Nisannu fell on 22/23 April (from evening 22 to evening 23) in the Julian calendar. After sunset (at c. 18:30) and before moonset (c. 19:34) on April 22 the new moon became visible c. 5.5o east of (= behind) α Taurus, the most brilliant star in the constellation of Taurus (“the Bull of Heaven”). This is close enough to the position given on the tablet. In 588 BCE day 1 of Nisannu fell on 3/4 April according to the modern calculations of the first visibility of the new moon after conjunction. Between sunset (at c. 18:18) and moonset (at c. 19:14) on April 3 the new moon became visible at the western end of the constellation of Taurus, about 14o west of (= in front of) α Taurus. Thus the moon was clearly not behind the constellation of Taurus at this time. This position, therefore, does not fit that on the tablet. But as stated above, Furuli moves Nisannu 1 of 588 about one month forward in the Julian calendar, which is required by his identification of the lunar eclipse dated to month III on the tablet with the eclipse of July 15, 588. (Furuli, p. 296) This should have moved 1 Nisannu to 3/4 May, 588 BCE, a date that is scarcely possible, as all the evidence available shows that 1 Nisannu never fell that late in the Julian calendar in the Neo-Babylonian or any later period. But Furuli goes on to make an even more serious error in connection with this relocation of Nisannu 1. On page 311 Furuli explicitly states that, “In order to correlate the Babylonian calendar with the Julian calendar, I take as a point of departure that each month began with the sighting of the new moon.” He goes on to explain that, due to bad weather conditions, the month could sometimes “begin a day after the new moon.” Despite this pronounced (and quite correct) point of departure, Furuli, in his discussion of the planetary positions on page 296, dates the 1st of Nisannu in 588, not to 3/4 May but to May 1. He does not seem to have realized that this was not the date of the sighting of the new moon after conjunction. On the contrary, this date not only preceded the first sighting of the new moon by two days, but also the date of conjunction (the time of lunar invisibility) by one day! Later on, in the beginning of his discussion of the lunar positions on page 312, Furuli seems to have discovered that the May 1 date is problematic, because here he suddenly and without any explanation moves the beginning of 1 Nisannu in 588 forward, at first from May 1 to the evening of May 3, but finally, in the table at the bottom of the page, to the evening of May 2! Such manipulations of the Julian date for 1 Nisannu are, of course, inadmissible. One cannot have three different dates for 1 Nisannu in the same year! True, the conjunction did occur on 2 May, at c. 03:39 local time. (Herman H. Goldstein, New and Full Moons 1001 B.C. to A.D. 1651, Philadelphia: American Philosophical Society, 1973, p. 35) But this does not mean that the new moon became visible on that day in the evening after sunset. For a number of reasons, the time interval between the conjunction and the first sighting of the new moon is considerable. As Dr. Sacha Stern explains, “the time interval between conjunction and first evening of visibility is often as long as one day (24 hours); it ranges however, at Mediterranean latitudes between a minimum of about 15 hours and a maximum of well over two days.” (S. Stern, Calendar and Community, Oxford University Press, 2001, p. 100) The results of modern examinations of the first lunar crescents recorded on the Babylonian astronomical tablets from 568 to 74 BCE are presented by Uroš Anderlič, “Comparison with First Lunar Crescent Dates of L. Fatoohi,” available on the web at: http://www.univie.ac.at/EPH/Geschichte/First_Lunar_Crescents/Main-Comp-Fatoohi-Anderlic.htm . Thus the new moon could not be seen in the evening of 2 May, either. The earliest time for the visibility of the new moon was in the evening of 3 May, as stated above. Assuming that this incredibly late date for 1 Nisannu were correct, we find that the new moon did appear behind the constellation of Taurus in this evening (of May 3) between sunset (at c. 18:36) and moonset (at c. 20:05). But it was closer to the constellation of Gemini than to Taurus, so the position of the moon still does not fit very well. In conclusion, the two dates for 1 Nisannu (1st and 2nd May) that Furuli actually uses in his computations are impossible. And should he have used May 3 as the date for 1 Nisannu, this would not have been of much help to him, as all the three dates are unacceptably late as the beginning of the Babylonian year. In 568 BCE the 8th of Nisannu fell on 29/30 April. In the beginning of the night on April 29 the moon stood about 3.6o northwest of β Virginis, or about 2o to the west (in front of) and 3o to the north of (above) the star. This agrees quite well with the Babylonian measurement of 2o, which, of course, is a rather rough and rounded-off figure. But this is wrong, too. In the “beginning of the night” of 11 May 588 the moon stood, not to the west of (in front of), but far to the east of (behind) β Virginis (about 13o to the east of this star at 20:00). To add to the mess, the altitude/azimuth position of the moon in Furuli’s two columns to the right in his table is wrong, too, as it shows the position near midnight, not at “the beginning of the night” as the tablet says. In 568 BCE the 1st day of Month II (Ayyaru) fell on 22/23 May. The distance between sunset this evening (at c. 18:49) and moonset (at c. 20:46) was c. 117 minutes. This distance between the moon and the sun was long enough for the new moon to become visible while the sun still “stood there,” i.e., just above the horizon. At its appearance the new moon stood about 7.3o south of (below) β Geminorum, which is very close to the position given on the tablet. As Furuli has dated Nisannu 1 to 1 May, and later to 2 May, the 1st of Ayyaru should fall one lunar month later. Furuli (p. 314) dates it to June 1. This, however, conflicts with his earlier dates, because if Nisannu 1 began in the evening of 1 May as he holds at first (p. 296), and if Nisannu had 30 days as the tablet says, he should have dated the 1st of Ayyaru to May 31. But because he later on redates the beginning of Nisannu 1 to the evening of 2 May (p. 312), he is now able to date the 1st of Ayyaru to 1 June. But as was pointed out earlier, the 2 May date for Nisannu 1 is unacceptable, too, as the moon did not become visible until 3 May. Furuli’s choice of 1 June seems to be due to the fact that the new moon could not be sighted until that day. It became visible at sunset (c. 18:56) about 9.7o below β Geminorum. This is not “exactly 4 cubits below” this star, as Furuli states (p. 314), but close to 5 cubits below it. Yet this would have been an acceptable approximation, had the date been right. But it does not only conflict with Furuli’s dating of Nisannu 1 to 1 May; the month of Ayyaru never began as late as in June. In addition, the altitude/azimuth position Furuli gives in his table (+ 54 and 256) is also wrong, as it does not show the position of the moon at sunset, but at c. 15:16, when it was still invisible. Actually, Furuli’s figures for the altitude/azimuth position at the time of observation are so often erroneous that they will henceforth be ignored. The only detail that fairly corresponds to the statement on the tablet, then, is the position of the moon. Everything else is wrong. (4) Obv.´ line 12: “Month III, (the first of which was identical with) the 30th (of the preceding month), the moon became visible behind Cancer; it was thick; sunset to moonset: 20o [= 80 minutes]”. The reason is that the conjunction had occurred earlier on the very same day, at about 03:30. (H. H. Goldstine, op. cit., p. 35) In the evening the time distance between sunset (at c. 19:09) and moonset (at c. 19:32) was still no more than 23 minutes, i.e., less than 6o, so the moon was too close to the sun to be visible. Furuli does not comment on the fact that the tablet gives the distance between sunset and moonset as much as 20o (80 minutes), showing that the moon on Simanu 1 was far enough from the sun during the observation to be visible, contrary to the situation in the evening of June 30 in 588. For this reason alone Furuli’s date is disqualified. In 568 BCE the 8th of Simanu fell on 27/28 June. My astro-program shows that in the early night of June 27 the moon stood c. 4.5o south of β Librae, which is very close to the position given on the tablet. Furuli, who dates the 8th of Simanu to the 7th of July, 588 BCE, claims (p. 316) that the moon on that day “was 2 ½ cubits below β Librae, so the fit is excellent.” Again, Furuli is wrong. In the “first part of the night” on 7 July 588 BCE the moon stood as much as c. 6 cubits (12o) west of (i.e., far from below) β Librae. It was in fact closer to the constellation of Virgo than to Libra. So Furuli’s date does not fit at all. In 568 BCE the 10th of Simanu fell on 29/30 June. In the first part of the night of the 29th, the moon stood about 8o above (north of) α Scorpii, which is very close to the position described on the tablet. As Furuli had dated Simanu 8 to July 7, he should have dated Simanu 10 to 9 July 588. But strangely, he mistranslates it into 10 July and claims (p. 317): “The moon was 3 ½ cubits (7o) above α Scorpii, so the fit is excellent.” But in the “first part of the night” that day the moon was over 5 cubits (10o) northeast of α Scorpii. And even if we move back to the early night of July 9, the moon at that time was about 5 cubits (10o) northwest of α Scorpii. It would not be correct to state of any of these lunar positions that the “fit is excellent”. None of them fits. In 568 BCE the 15th of Simanu fell on 4/5 July. The expression “one god was seen with the other” refers to the situation when the sun and the moon are both visible at the same time when standing in opposition to each other. This was the situation in the early morning of 5 July. From sunrise in the east at c. 04:51 to moonset in the west at c. 05:24, i.e., for about 33 minutes, “one god was seen with the other.” This is very close to the time distance recorded on the tablet, 7o 30´, or 30 minutes. Line 17 also records “a lunar eclipse which was omitted […. ]”, an expression used of an eclipse that had been predicted in advance to be invisible from the Babylonian horizon. The text is somewhat damaged, but the reference is obviously to the lunar eclipse of July 4, 568 BCE, which according to modern calculations began about 12:50 and lasted until 14:52, local time. As it took place in the early afternoon when the moon was below the horizon, it could not be observed in Babylonia. Furuli dates Simanu 15 to 15 July 588 BCE. True, there was a lunar eclipse on that day that was invisible from the Babylonian horizon. Furuli claims on page 317 that “the eclipses of July 15, 588; of July 4, 568; and of June 24, 586, all occurred on Simanu 15 and fit the description.” However, the time distances between sunrise and moonset at the dates in 588 and 586 do not fit at all with the information on the tablet. On 15 July 588 the moonset (at 04:50) occurred about five minutes before sunrise (04:55), so the two “gods” could not been seen with each other that day. And the same problem is connected with the June 24, 586 BCE date. Of the three alternatives, therefore, only the July 4, 568 BCE date fits the information on the tablet. The signs within brackets are illegible and the text had to be restored by Hunger. But as he himself later explained, the word “moon” was just a guess that he had not checked. Modern calculations show that, if the day number (which is lost, too) was the 16th (July 5/6), the heavenly body that was below “the bright star at the end of the Lion’s foot” (= β Virginis) must have been Venus, not the moon. This was later pointed out also by Johannes Koch (JCS 49, 1997, p. 84, n. 7, and p. 89). However, Koch calculates that Venus in the first part of the night of July 5 was 0o 02´above and 1o 06´ behind β Virginis, while the SkyMap Pro 11 program shows that Venus at that time was not 0o 02´above but about 0o 64´ below and about 0o 89´ behind β Virginis. These results are in closer agreement with the tablet. The “Swallow” covered or included a part of the constellation of Pisces. The exact extension of the “Swallow” is not quite clear. But it included a band of stars called “DUR SIM-MAH (ribbon of the swallow)” which included at least δ, ε, and ζ Pisces, perhaps also some other stars. The “ribbon of the swallow” is referred to in over a dozen astronomical reports dating from 567 to 78 BCE, and these have been helpful in locating at least some stars in the group. (Alexander Jones, “A Study of Babylonian Observations of Planets Near Normal Stars,” Archive for History of Exact Sciences, Vol. 58, 2004, pp. 483, 490) The “Swallow”, then, comprised at least the “ribbon of the swallow” and then extended westward along the Pisces. Furuli’s discussion of SIM and SIM-MAH on page 296 is thoroughly misleading, as he tries to confuse the issue by referring to some older views without telling that they were abandoned long ago. This is true of Kugler’s suggestion back in 1914 that SIM-MAH applies to the northwest of Aquarius. To be sure, Furuli states that two modern scholars, E. Kasak and R. Veede, in an article published in 2001 applies SIM to “the Bull of Heaven” (Taurus). They do not! In their article (available on the web: http:/folklore.ee/folklore/vol16/planets.pdf) they do not mention SIM at all! Furuli also refers to the conclusion of van der Waerden (1974) that it applies to “the south-west part of Pisces” – as if this would be yet another view. The fact is that his conclusion does not conflict with that of other modern scholars, including that of Jones, Hunger, and Pingree. The impression Furuli tries to give, that modern experts widely disagree about the identity of SIM and SIM-MAH, is false. All agree that it covered or included a part of the constellation of Pisces. 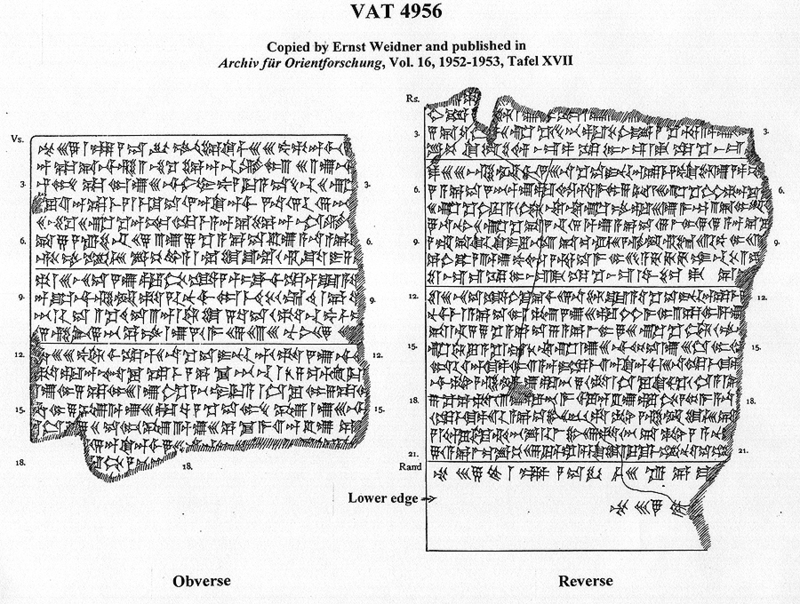 There can be no doubt that the moon on February 12, 567 BCE was “in the Swallow,” just as is stated on the tablet. At that time Jupiter could also be seen in Sagittarius as the tablet says. Furuli’s date for Shabatu 1 is 22 February 587 BCE. And it is true that the moon on that day was “in the Swallow.” One problem with this date, however, is that the new moon at sunset was so close to the sun (less than 10o) that it most probably was invisible. The conjunction had occurred earlier on the same Julian day, at c. 01:26. Besides, Jupiter was between Aries and Pisces, far away from Sagittarius where it is placed by the tablet. In 568/567 BCE the first day of month XII (Addaru) fell on 14/15 March 567 BCE. On day 14 the distance between sunset (at c. 18:06) and moonset (at c. 19:50) was 104 minutes (26o), which is very close to the Babylonian measurement, 25o (100 minutes). The distance between the moon and the sun was long enough for the moon to become visible before sunset (“while the sun stood there”). At that time the moon stood about 15o southeast of α Aries, thus partially behind and partially below the most brilliant star in Aries. This roughly agrees with the position given on the tablet. Furuli’s date for Addaru 1 is 24 March 587 BCE. Of the position of the moon Furuli says (p. 321): “The moon was 13o to the left of (behind) Aries, so the fit is excellent.” This is not quite correct. About 86 minutes (c. 21.5o) before sunset (“while the sun stood there”), the moon stood about 7o to the south of (below) the nearest star in Aries (δ Aries) and about 20o to the southeast of (i.e., partially below and partially behind) α Aries. This position is not very exact, but acceptable. In 567 BCE the 2nd of Addaru fell on 15/16 March. In the night of the 15th, at c. 19:00, the moon was 4 cubits (8o) directly to the south of (below) η Tauri, also known as Alcyone, the most brilliant star in the star cluster Pleiades. This position agrees exactly with that given on the tablet. Furuli dates Addaru 2 to 25 March 587 BCE. In the night of that day, at c. 19:00, the moon was about 10.5o southeast of η Tauri, a position that does not agree very well with that given on the tablet. The fit is definitely not “excellent” as Furuli (p. 321) claims it is. In 567 BCE the 7th of Addaru fell on 20/21 March. In the night of the 20th/21st the moon stood between α Leonis and Praesepe, the latter being an open star cluster close to the centre of the constellation of Cancer. As they lie about 23o apart, the halo must have covered a large area in the sky. The next line (line 15), in fact, goes on to state that “the halo surrounded Cancer and Leo.” As the moon stood between these two constellations, its position agrees with that given on the tablet. Furuli’s statement (p. 322) that Cancer “is either the constellation or the zodiacal sign that covers 30o of the heaven” is anachronistic, as the zodiacal belt was not divided into signs of 30o each until much later, in the Persian era. Furuli’s date for Addaru 7 is 30 March 587 BCE. He states that Cancer in that night “was 4o above the moon and α Leonis was 13o below the moon.” However, Cancer was not above but in front of (west of) the moon, and α Leonis was not below but behind (east of) the moon. But as this lunar position was nearly the same as on 20/21 March, 567 BCE, both positions fit. In 567 BCE the 12th of Addaru fell on 25/26 March. According to the tablet sunrise occurred 1o 30´ – 6 minutes – before moonset, meaning that one “god” could be “seen with the other” in the morning for six minutes. My astro-program shows that in the morning of March 26 the sun rose at c. 06:08 and the moon set c. 06:11, that is, they could both be seen at the same time above the horizon for about 3 minutes, which is close to the time given on the tablet. Although it is true that the moon was nearly full when it was seen with the sun, this is not exactly what the expression refers to. As explained earlier, it refers to the situation when the sun and the moon stand in opposition to each other – the sun in the east and the moon in the west – and both can be seen simultaneously above the horizon for a short period of time. As Furuli has not understood this, his comments on the text are mistaken and irrelevant. Furuli’s date for the 12th of Addaru is 4/5 April 587 BCE. In the morning of April 5 the sun rose at c. 05:54. But the moon had already set at c. 05:13, i.e., about 41 minutes before sunrise. Thus one “god” could not be seen “with the other” this morning. Furuli’s date, then, is wrong. Only the 567 BCE date fits the statement on the tablet. In summary, at least 10 of the 13 lunar positions examined fit the 568/567 BCE date quite well, one (no. 10) is acceptable, while two (nos. 2 and 5) are acceptable only if the dates are moved back one day. Of Furuli’s dates in 588/587 BCE only one (no. 12) fits, while 9 do not fit at all. The fits of the remaining three (9, 10, and 11) are far from good but acceptable. The conclusion is, that the observations were made in 568/567 BCE. The year 588/587 BCE is definitely out of the question.